Are you tired of your home’s current heating system? This is the time of year when we hear from many homeowners about big repairs, breakdowns, and the desire to upgrade to a new system in spring. Sometimes we let the warm temperatures of spring and summer lull us into a false sense of comfort where we forget about the problems our heater created in winter. So, take a moment to think back. If you’re having problems with your heating system now, how long have you had them? We see a lot of homeowners that have the same root issue with different symptoms that result in different repairs needs over time. When it’s time to upgrade your heating system, make sure that you come to Cowboys Air Conditioning & Heating. Not only do we work with the best brands on the market, but we also have the most skilled technicians in the area. We’re here to help. 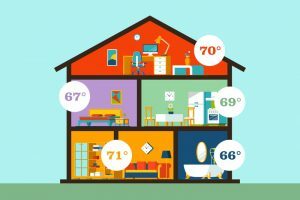 If you’re considering upgrading your heating, consider implementing a zone system in your home here in San Antonio, TX.